No one could doubt that Frederick Warren Merriam was one of the earliest and most important of Britain’s aviation pioneers. Indeed, he taught many of the others to fly; men such as Air Chief Marshal Sir Philip Joubert de la Ferte, Air Commodore P.F.M. Fellowes (who led the aerial Houston Everest Expedition), and Sub-Lieutenant R.A.J. Warneford VC, the first pilot to shoot down a Zeppelin. 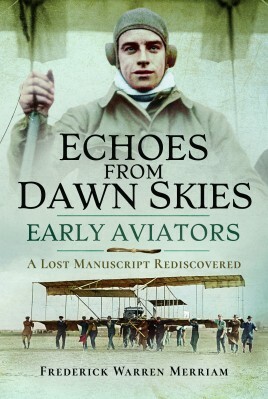 In his later years, Merriam decided that he wanted to compile a book that presented ‘a more personal and intimate picture than has yet been produced by aviation history writers of the civil pioneers of British flying’. It was no simple task. The remarkable collection of stories that Merriam gathered together was never published, his death in 1956 curtailing the project. For more than sixty years the manuscript lay hidden away, all but forgotten, until it was rediscovered in 2013.